If you’re not a major polluter, or employing garment workers in developing countries, or making potentially dangerous products, do you still have social responsibilities? What if you don’t have shareholders, investors, or clients to challenge you at the end of the year about how much good you’ve done to benefit the planet or community? If your chosen path is to operate as a profit making enterprise, is it even possible, as a small to medium sized enterprise (sme), to reinvest your time and/or your profits to benefit your community, or environment? It was a giant leap of faith when I decided to start a new enterprise on the family farm. Yet it’s meant that we – me and husband, Jon – have been able to re-invest their profits and time to help local communities. Hush Farms was born just four years ago, spurred by the premature death of a third sister-in-law. 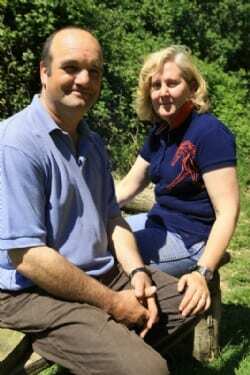 We already ran a training business for land based skills, so it seemed a natural progression to open the farm gates to provide Personal and Corporate Development – using animals and the stunning countryside of East Devon. However, this time, rather than creating a business to generate profits for the family, the idea was to use the profits to sponsor respite for anyone in need. The moment the first visitors arrived – veterans of the armed forces, ranging in ages from 20 to 60+ years – I realised that Hush Farms was far more powerful than they could ever have imagined. People arrived, suffering with extreme anxiety, but, within half a day, could be found joining in activities with complete strangers. One visitor, even, who had been living as a recluse, has since gone on to volunteer for community services – and that’s after just one day experiencing the power of time at Hush Farms. How does this happen? Time with the animals helps visitors to contemplate topics such as intimidating behaviour (theirs or that of others), how to build trust, or how to gain co-operation and respect, to name a few. One visitor specified that they wanted to ‘find their voice’ and that was definitely achieved, so much so that their career accelerated from an administrative role to a post as Regional Director, within the space of a year. 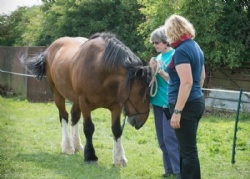 It all began by asking the horse to move around the field, after which they started to ask their colleagues to undertake certain tasks with the horses before finally, walking the length of two fields to issue instructions back to base camp… with a little coaching on breathing and exercising their vocal chords. Everyone was shocked to find that this person possessed such a melodious voice; something that she’d learnt to conceal after being bullied at school for having an ‘unusual’ voice. It was a life-changing revelation that she never expected from her time at Hush Farms. Hush Farms allows us to run a business that holds true to our personal values by taking time to help others and giving, as well as making profits. This must be far easier for an SME to achieve than a multi-national, attempting to gain consensus of the values to drive their strategy from 5,000+ employees. From the very start of setting up Hush Farms, it’s been a test of our belief to make this work. It took 18 months just to find an insurance service interested in supporting a new and out of the ordinary venture. Now, after four years, we have a firm idea of what it is that’s so special about all that we do – it’s far more than ‘respite’… Hush Farms is a catalyst for change for people from all walks of life. We pass on skills, some of which make them safe at work and some of which give people the confidence to know their own mind. However, we knew we couldn’t get these results on our own. So we’ve sourced a great team of specialists to help us make all of this possible, including Powerful Performance, who have experience on a global scale of transforming people’s mindsets. When we began, we faced the choice of setting up a charitable trust, CIC, or a Social Enterprise that could attempt to raise hundreds of thousands of pounds to operate. At a glance you might wonder whether we ought to be on that flight path, but we believe it would be a short-haul, with a limited life span for the funding. We’re very pleased that we’re doing what we do best: concentrating on doing what we love doing and running a profitable business to be self-sufficient for the long haul. The Dream is to leave a legacy by passing on the concept of Hush Farms for future generations to adopt the same approach. Beatrix Potter managed it – we want to follow in her footsteps. Operating as a business, rather than a charity, means that the concept is more likely to be sustainable and scale-able. Our experience to date has been that we are able to sponsor up to 150 visitors in a year, without needing to spend hundreds of thousands of pounds; with the generosity of friends who give their time and skills, free of charge. What’s more, we know that keeping it on a small scale allows everyone to make decisions that are completely aligned to what we want to achieve and it keeps the experience at a very personal level, for both visitors and us – after all, ‘small is beautiful’. We also now have the ability to deliver our services around the UK, tapping into a network of people with the skills, farms, woodland, country and city parks. The unexpected knock-on effect of this approach has been that CSR has significantly enhanced the reputation and ‘brand value’ of Hush Farms. Customers for the land based training and Corporate Development services are attracted to Hush Farms because we’re ‘different’, ‘…more than other training companies’. As Hush Farms has discovered, CSR isn’t just good for people and planet: increasingly it is driving profitability too. Money may still be tight in this post financial crash era, but values are more important too. Clear ethical values and social responsibility could give businesses of any size that critical ‘edge’ and deliver real success.